Hundreds of police and sheriffs’ officers — about half of them donning military battle fatigues — converged on downtown Oakland's Marriott Hotel today for the first day of Urban Shield, one of the nation's largest security conferences and weapons shows. Outside the Marriott, dozens of community members representing churches and racial and economic justice organizations, rallied against the event. United under the name Facing Urban Shield, the coalition said the militarized tone of the event reflects the worsening human rights records of police forces around America, and the waste of billions on jails and state prisons. They also said the presence of arms dealers in the city undercuts Oakland's efforts to stem gun violence. 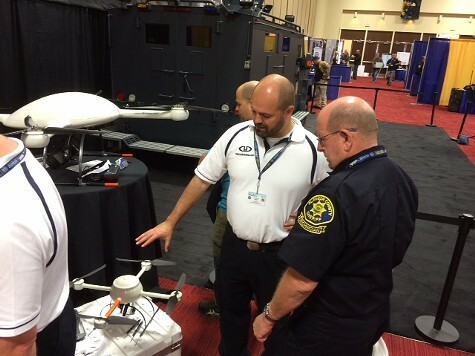 Inside the Urban Shield conference, dozens of vendors showed off robots, drones, assault rifles, and computer software to officers and staff from police agencies all around Northern California. "This is our seventh year," said James Baker, president of the Cytel Group, which works with the Alameda County Sheriffs Office to organize Urban Shield. Baker is a former sheriff’s deputy who retired to run Urban Shield in the Bay Area and beyond full time. His company Cytel trademarked the name "Urban Shield," and now organizes the event for other regional coalitions of law enforcement in Boston, Texas, and even overseas. "We're expanding into the Middle East, Africa," said Baker. Funding for Urban Shield comes via the US Department of Homeland Security. Baker said the event is growing, and that it all started here in the Bay Area. Alameda County Sheriff Gregory Ahern, whose department has hosted Urban Shield since 2007, said the event represented critical real-world training for law enforcement. “The scenarios are based off real events that have occurred over the past two years, said Ahern. The goal is for law enforcement and emergency services to learn how to cope with a variety of disaster and terrorism-related scenarios over an area of five counties and eight hundred square miles. Ahern said training received during Urban Shield by the Boston Police Department's SWAT team proved critical in the response to the Boston Marathon bombing last spring. Inside the vast vendors hall, cops tried out handguns and rifles and listened to sales representatives from companies like Motorola Solutions and Cisco Systems explain how their communications and data processing technologies can be used to police American cities. At least three companies that design and sell drones were in attendance. Two armored personnel carriers were parked inside. One of them, a hulking armored vehicle manufactured by Lenco, is set up for group pictures, allowing conference attendees to climb on its running boards and pose. Another company named Wamar Technologies is selling a "tactical van," which is outfitted with four-wheel drive and a gallery of LCD monitors feeding video, maps, and other data into a mini-theater inside. A sales rep for Wamar said the going price is a quarter-million dollars. "Business is slow here in the US with law enforcement because of tight budgets," said Wamar's rep, "but overseas we're selling well." The Oakland Police Department was showcasing its portable observation tower, a crane manufactured by the FLIR corporation that has an enclosed command post at the top decked out with multiple surveillance cameras and sensors. Gun manufacturers Heckler & Koch and Sig Sauer showcased automatic rifles and semi-automatic pistols. A portable virtual shooting range was on display. The range was housed in an inflatable enclosure, virtually identical to the kind of inflatable children's bounce toy that parents rent for birthday parties. Copies of Counter Terrorism magazine, which bills itself as a "journal for law enforcement, intelligence, and special operations professionals, were stacked on tables. Classes are ongoing during Urban Shield. The conference began with a session on "Countering violent extremism in the U.S.," featuring a senior Department of Homeland Security advisor, Ifran Saeed. While organizers of Urban Shield have been keen on pointing out that the event brings together all emergency first responders, including fire and medical, the trade show itself is dominated by police agencies and companies selling weapons and surveillance gear. Journalist Will Potter, who has closely tracked the criminalization of political dissent and is the author of Green is the New Red, said exercises such as Urban Shield are “part real world training” and “part spectacle” that are designed to show off the force law enforcement has at its disposal while casting certain political groups and ideologies in a negative light. “There's been an extremely disproportionate focus on what could generally be described as left-leaning groups,” said Potter. Instead of focusing on the violence committed by right-wing extremists, Potter said, anarchists, environmental activists, and proponents of animal rights who have never engaged in violence against people are targeted. “If they did the same thing for Tea Party activists or anti-abortion extremists, there'd be a public outrage among members of Congress,” Potter said.